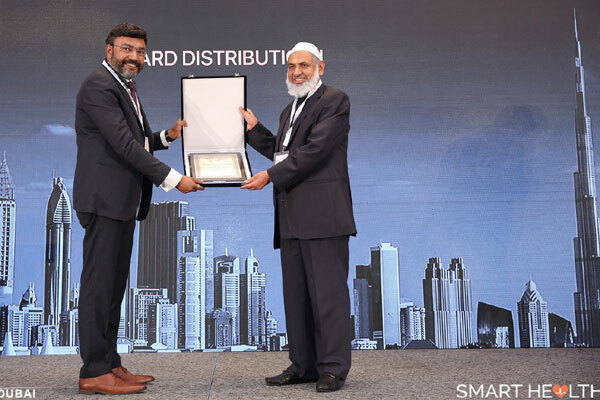 Spotcheck, a technology driven health and wellness services provider based in the UAE, said its co-founder Dr Manoj Menon has won top award at the recently held Smart Health Dubai conference for his pioneering health and wellness eco-system. The Smart Health Dubai conference, a platform held in Dubai once a year, brings together decision-makers from corporates and government organizations from across the Middle East with researchers and investors in order to share knowledge and build alliances. The two-day event took place at Raffles Hotel and was attended by over 200 individuals. During the event, Dr Menon was awarded as one of the top 50 leaders in the healthcare sector in the region for Spotcheck, a technology driven health and wellness services provider, which offers an 8 minutes non-invasive health screening and a digital platform. The pioneering Spotcheck ecosystem incorporates a non-invasive health assessment kiosk and a digital platform, Enhapp, which provides the user with a personalized condition specific wellness program comprising fitness routines, meal programs, engagement with lifestyle coaches and tele-consulting sessions. The kiosk uses FDA and CE approved health assessment technology and is being introduced to corporate and government organizations that have a strong internal focus on employee wellbeing. Dr Menon carries 27 years’ experience and expertise in strategic informational technology planning with special emphasis on the healthcare sector, said a statement from Spotcheck. Along with his team, he began developing the Spotcheck kiosk and the wellness ecosystem in 2015. The system is geared towards corporates, government organizations, hospitals and clinics. Spotcheck has successfully completed 6,500 health assessments with an accuracy rate of 98.5 per cent. On the award, Dr Menon said: "It’s a true honour to be recognized in this way by Smart Health Dubai, a highly regarded event in the healthcare technology space. Receiving this accolade coincides with the launch of the ENHAPP digital platform for our valued customers in the corporate and government sector." "We are working closely with the HR Managers and the Health & Safety Managers to build a sustained wellness program for their employees," stated the co-founder of Spotcheck, a B2B2C wellness company that motivates, drives and enables people to lead healthier lives in ways that are sustainable.